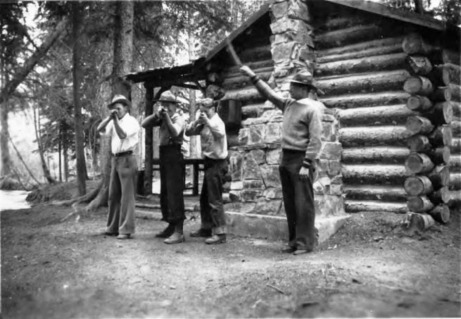 A group of young men from Cranbrook, British Columbia, members of the Rover branch of the Boy Scouts, built this cabin deep in the forest to use as their private clubhouse in the happy days before the Second World War. Four of them died while serving their country. Now all that remains is the stone fireplace, a crumbling memorial to those brave young men who never returned to the mountains they loved so much. The Rover program was created by The Boy Scouts Association to provide an option for young men who had grown past the age limit of 17 years. The Third Rover branch in tiny Cranbrook, British Columbia located in the mountainous southeast corner of the province – then with a population of 3,000 people – was launched in the 1930s. 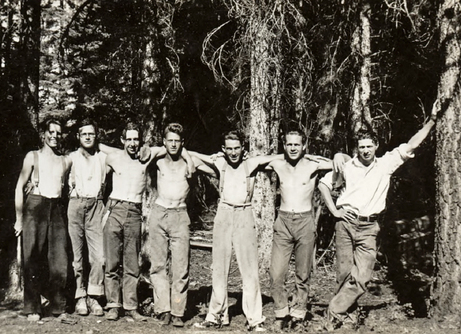 Led by Murray MacFarlane, the core group consisted of 16 young men: Lloyd “Butch” Burgess, Ted “Rasp” Smith, Frank Morro, Tack Wood and his brother Ed Wood, Fred Kolisnek, Frank Hinton, Jim Stone, Joe Ward, Frank Jones, James “Moose” Haley, Stan Whittaker, Ed Walsh and his brother Jerry, Stewart Flett, and Len Dingley. The Rovers participated in scouting events, but what they really enjoyed was fellowship. That usually meant hiking, camping, hunting, or jumping on their CCM Redbird bicycles and pedalling into the mountains. 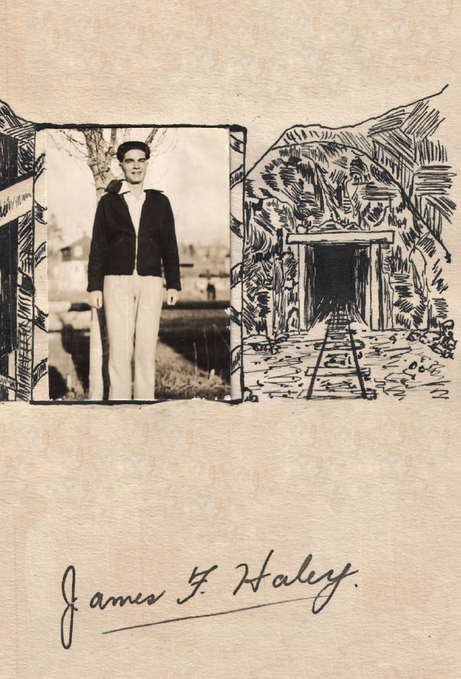 They documented many of their trips in elaborate journals, complete with maps, photos, and written accounts. Copies of those journals are now owned by the Cranbrook Historical Archives, and were shared with me by local historian David Humphrey. When the Rovers decided to build themselves an outdoor retreat, it was a humble affair. 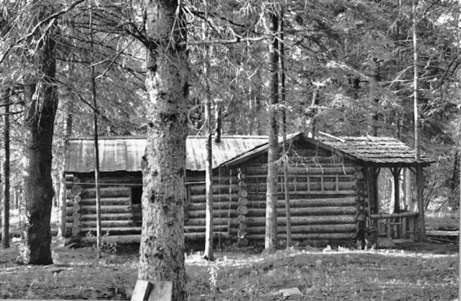 It began as a small log cabin located about five kilometres southeast of town, in a beautiful clearing on the bank of a rushing creek. 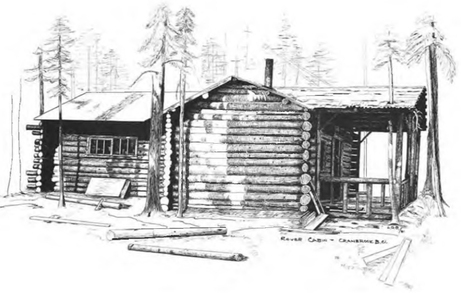 Lloyd "Butch" Burgess was a talented artist who sketched the cabin and many of the other illustrations in the Rover record books. (He also added the sketch of the raccoon to the top photograph). 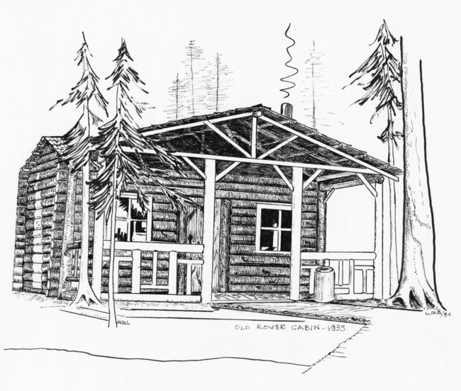 Here is Lloyd's sketch of the original, small Rover Cabin. 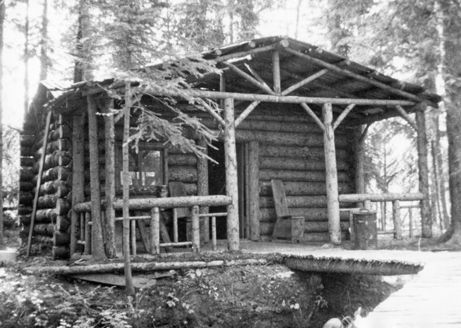 The Rover Cabin, or "The Den" or "The Shack" as it was called, was so well-used and well-loved that the boys built a large addition to the rear of the cabin in 1935, cutting and hauling the logs themselves. Lloyd sketched the larger cabin while construction was still in progress, as you can see by the unfinished surface on one side. Notice the tree growing through the roof of the front deck! It took about an hour to hike or ride their bicycles out from town, and everything had to be carried on their backs or dragged on toboggans. To save effort, they dug a nearby root cellar where they could store their perishables. The boys even built a bridge across the creek. 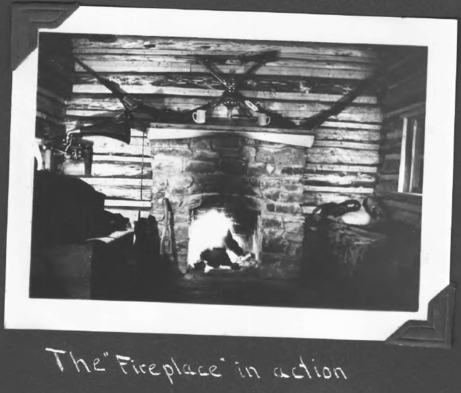 When completed, the fireplace served as a source of light and heat that proved especially useful in winter, since the cabin was used all year around. Happily, Frank Morro and Tack Wood also kept photo albums with many wonderful photos of the Rovers at work and at play. Here’s a great photo of seven Rovers, from left: Tack Wood, Ted Smith, Lloyd Burgess, Ed Wood, Ed Walsh, Jerry Walsh, and Frank Morro. 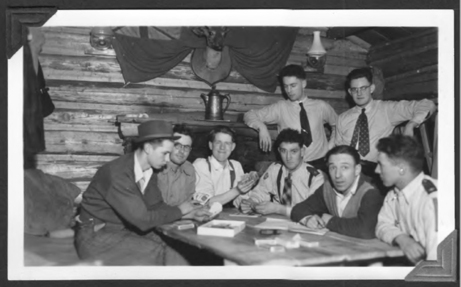 For about ten years, the same group of young men spent days, nights and weekends at the cabin. But it wasn’t until May 17, 1936 that they started a Rover Logbook to record all the activities that took place in the cabin, lasting until the final entry in June 1942. Looking at the photo albums and reading the Rover Logbook, I was struck by the healthy, clean living that these young men endorsed. Drinking was never mentioned, poker games broke up because some of the players had to get up early and go to church in town; and young ladies were always mentioned with respect. 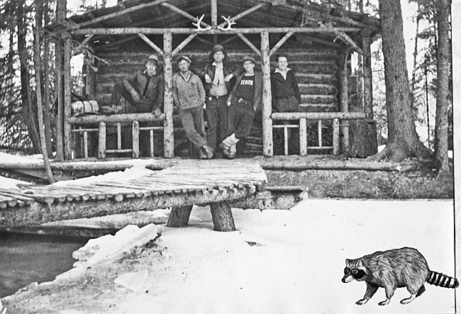 Parents and friends were often invited to the cabin for meals, but even when the Rovers were alone, one of them always said grace. For example, an entry on August 8, 1936 says that the boys started playing a card game at 10 p.m. and ended the game at 4:10 a.m. A few hours later, the boys “woke about 9 a.m. and fought until about 9:30 (during the fight, a lamp chimney was broken) and then sat down to breakfast. After breakfast, we spent the day playing tin-ball, duck on the rocks, and pig in the hole.” After a full day of activities, they went home about 8:45 p.m.
Here’s a photo of the boys playing cards. They also cut their own firewood, and kept the cabin clean and tidy. Eating was of utmost importance and meals were described in great detail. Frequent references were made to cutting the cards to see who washed the dishes! Aside from eating and wrestling, there was little else in the form of indoor entertainment, so games were popular. As well as whist and poker, they played Monopoly and pick-up sticks. 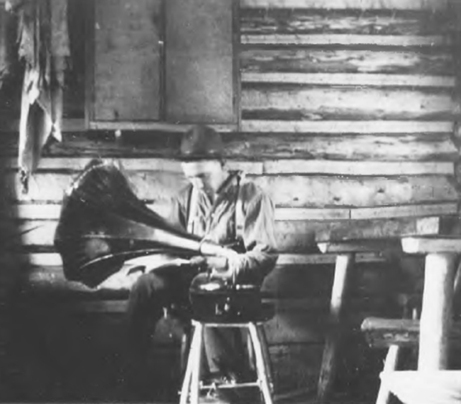 The boys also hauled a gramophone out to the cabin and spent many happy hours playing records. 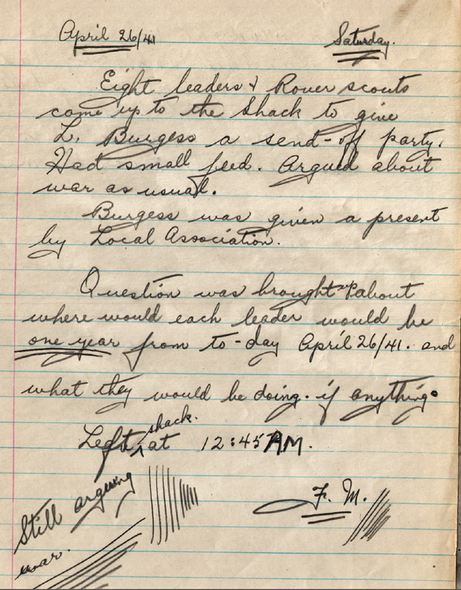 However, this was also a source of conflict, according to this entry on March 7, 1937. This photo of Lloyd Burgess with the gramophone shows that it must have been pretty difficult to heave it out of the window! And apparently it still worked afterward, too. The boys came up with their own outdoor games: horseshoes, hiking, shooting gophers, target practice using tin cans, and marathon snowball fights that lasted for hours. One entry dated February, 1937 reads: "Frank and Jerry played Cowboys and Indians on showshoes." Here's a game of target shooting in progress. Mostly, the Rovers loved to explore the natural world around them. They made many hiking and camping trips during the summer. As they termed it, they "went Rovering" all over the surrounding mountains, keeping track of all their expeditions. 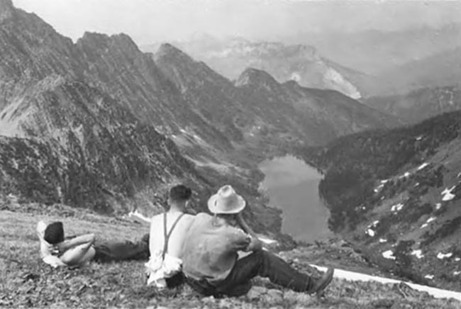 This photo shows three of them sitting on a mountaintop overlooking Cliff Lake. Winter didn't keep the boys at home. 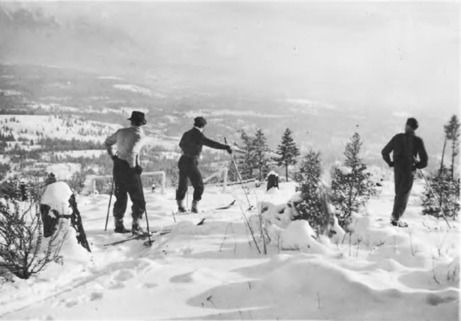 They cross-country skied for many miles (note the woollen clothing and wooden skis) no matter what the weather. 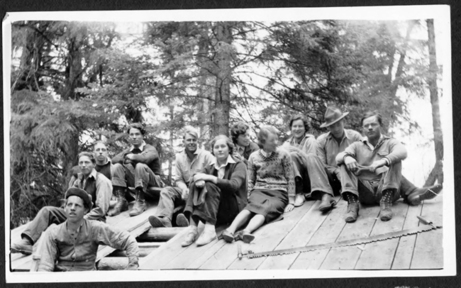 Here’s a photo of the boys entertaining the girls, all sitting on the roof of the cabin. When war began in 1939, there is no mention of it in the Rover Logbook, although its dark shadow fell into every corner of this country. Perhaps the Rovers preferred to keep this dreadful event separate from their happy days at the Rover Cabin. But the war came to them anyway. After the British Commonwealth Air Training Plan brought thousands of young men to Western Canada from other countries to train here, many of them were welcomed into local homes. The English flyer was training at the Service Flight Training School in Calgary, and coincidentally was also a member of the Boy Scouts from Bristol, England. 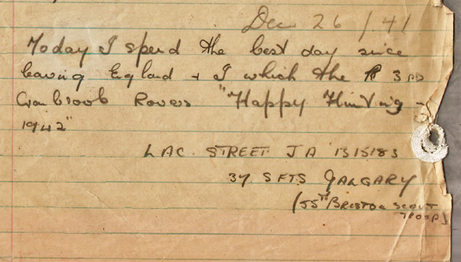 However, this entry in the logbook dated April 26, 1941 proved prophetic. The Rovers were exactly what the armed forces wanted. They were in fighting form, they were accustomed to hard labour, they knew how to use firearms, and best of all, they had already demonstrated unquestioning loyalty to their community and their country. And so the Rovers left, one by one, eager to join the fight for freedom. It isn't recorded how many enlisted, but I assume most of them did. They were Rovers, after all. One year after the above diary entry was written, the first Rover died in combat. 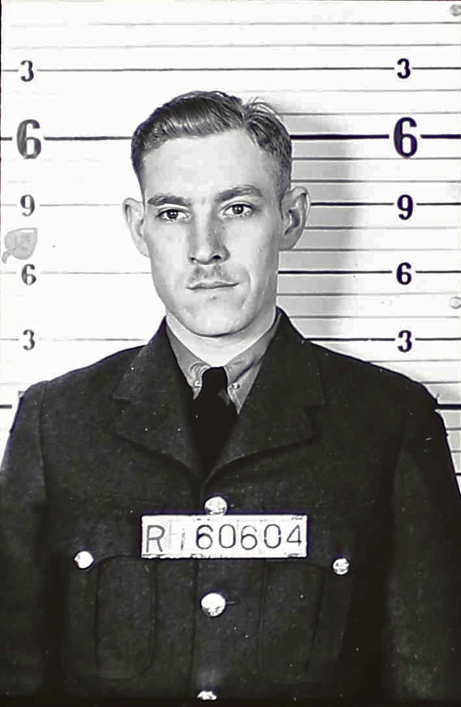 Royal Canadian Air Force Flight Sergeant, Wireless Operator James Franklin Haley, was one of the first to enlist. He was already a seasoned veteran of RAF Squadron 150 when his bomber was shot down on June 16, 1942. It was not to be. James Haley was reported missing in action, and later declared dead. The son of James and Florence Haley (his widowed mother remarried before the war, and became Florence Pantling), his body was found and buried at Bergen-Op-Zoom War Cemetery, Noord-Brabant, Netherlands. The following year saw another three Rovers meet their deaths. 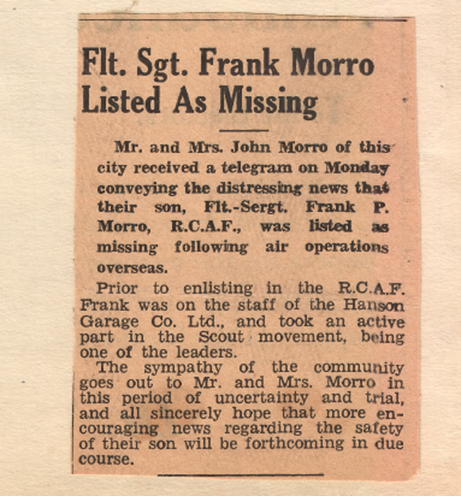 Royal Canadian Air Force Flight Sergeant, Air Bomber Frank Peter Morro, who wrote the entry about war at the Rover Cabin, was listed as missing on December 4, 1943 and declared dead on April 12, 1944. 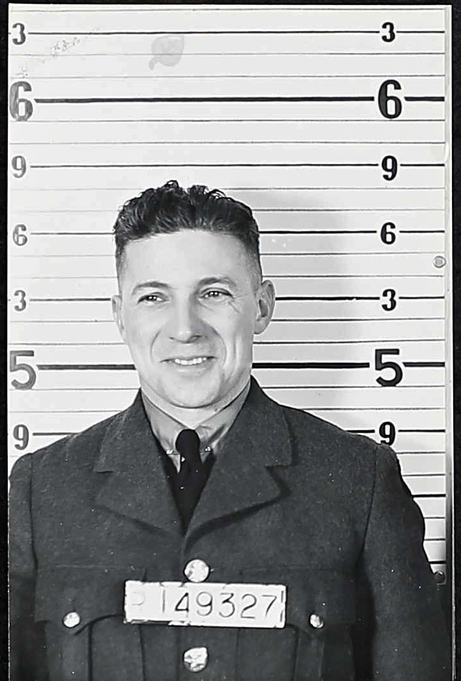 Frank was serving on a Halifax, on a bombing mission to Leipzig, Germany, when the seven-man bomber was shot down by a German fighter. 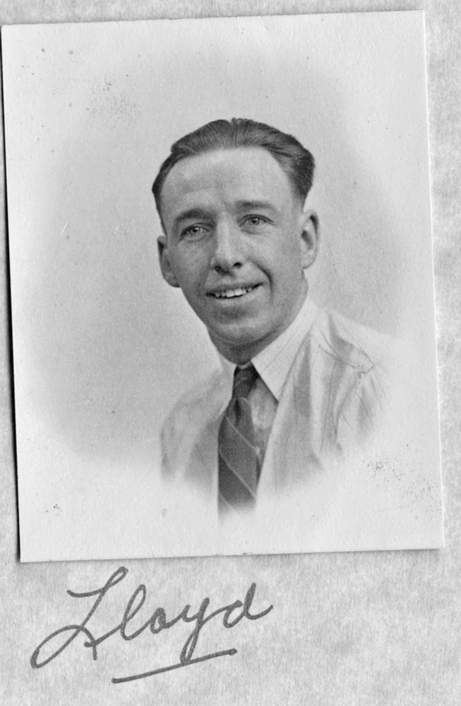 Three of the aircrew baled out and were captured, but the other four men, including Frank, were killed in the crash. 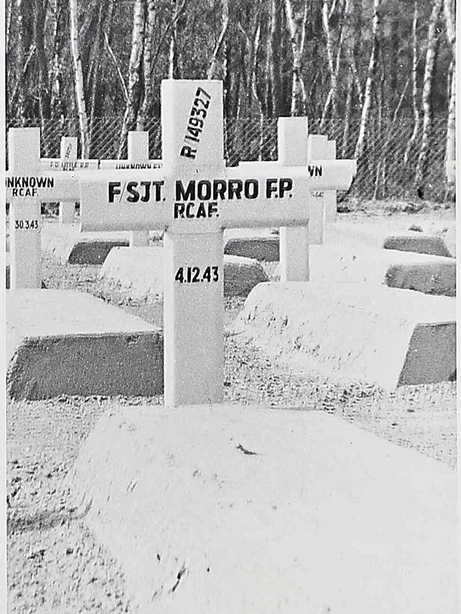 The son of John and Eva Morro, Frank's body is buried at Sage War Cemetery, Niedersachsen, Germany, beside his three fellow crew members who were also killed in the crash. ​Just two months later, on June 11, 1943, Royal Canadian Air Force Flying Officer, Navigator Stewart MacKenzie Flett, was killed at the age of 27. Stewart's aircraft took off on November 6, 1943 on a training run, and for unknown reasons, most likely mechanical failure, it crashed near Jurby on the Isle of Man, just west of mainland England. Death was instantaneous for all crew members. 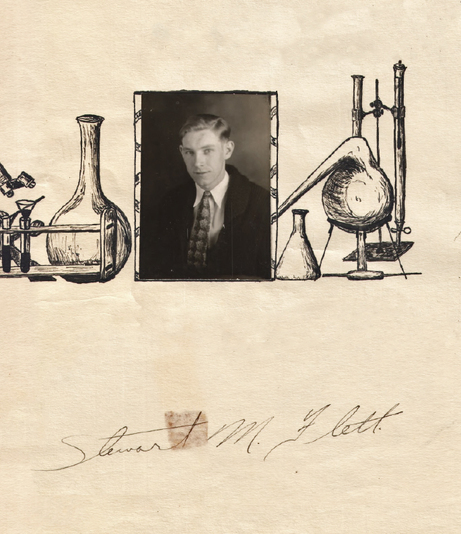 Stewart was the son of Thomas Robertson Flett and Annie Flett. His body is buried at the Jurby (St. Patrick) Churchyard, Isle of Man, United Kingdom. 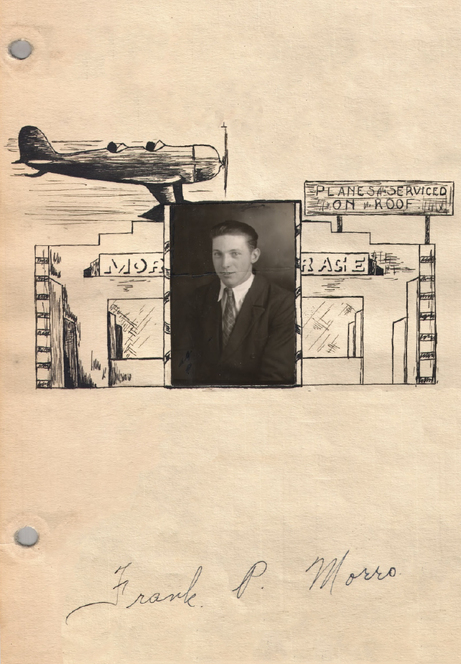 The fourth Rover who died was Royal Canadian Air Force Flying Officer and Navigator Leonard Douglas Dingley, who disappeared on flying operations on November 12, 1943 at the age of 24. The son of Edgar George and Hilda Dingley, his body was never found. Instead, Len Dingley is commemorated at Runnymede Memorial, Surrey, England along with 20,285 other names. The world would never be the same again – not only for the families of these brave young Rovers, but for the small community of Cranbrook and hundreds of others like it across Canada, which sacrificed so much in the name of freedom. In 1947, the federal government established a program to honour Canadian servicemen killed in action during the Second World War by naming geographic features in their memory. In the Cranbrook area, four mountains are named after the Rovers who died: Mount Morro, Mount Haley, Flett Peak, and Mount Dingley. Long after the war ended, the B.C. 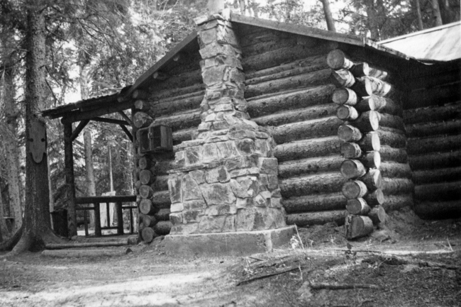 Forest Service discovered the abandoned Rover Cabin in the woods, and burned it down. It is their mandate to keep Crown land free of human habitation, and to prevent the cabin from being used for drinking or squatting. All that remains now is the stone fireplace. 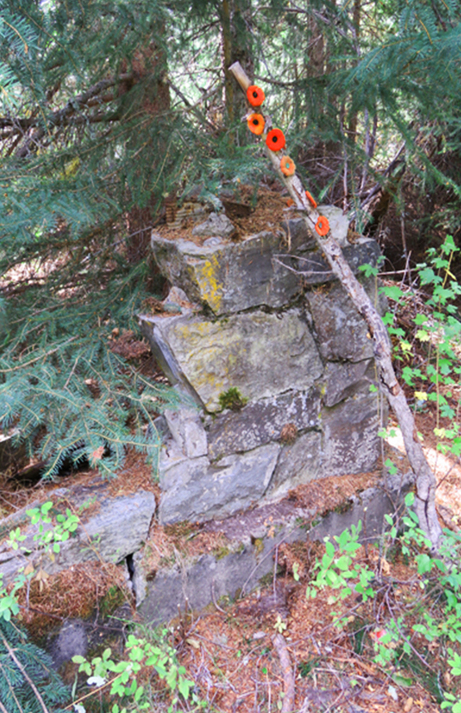 Every Remembrance Day for the last decade, Dan Mills of Cranbrook and several friends visit the remnants of the cabin, where they lay poppies to remember the four lost Rovers. Somewhere among the beautiful forests and streams of the Canadian Rockies, the ghosts of the young Rovers can still be heard laughing in the natural world they loved so much. 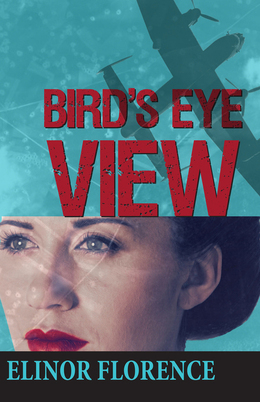 I spend a lot of time at public events, signing copies of my wartime novel Bird's Eye View, and also my new novel Wildwood, about a single mother from the big city who moves to an abandoned farm north of Peace River, Alberta. 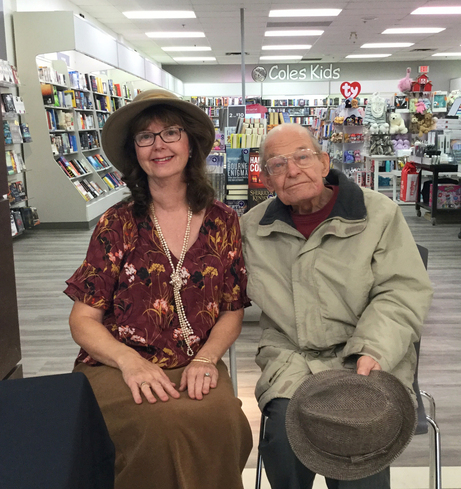 Recently I signed books at Coles in Cranbrook, B.C. (home of The Rovers), and I was delighted to have a visit from Second World War veteran Bud Abbott. Bud is an active 97-year-old who served as a navy pilot during the war. I interviewed Bud for my Wartime Wednesdays blog and you can read his incredible story here: Bombing the Tirpitz. This is my schedule for the next few months. At some of these events, I'll be giving a presentation; at others, I will be signing books only. More events may be added during the year. For full details, visit my Events page: Book Signing Events. May 19, 7 p.m. 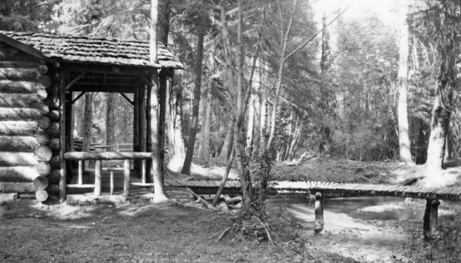 The Heidout, Cranbrook, B.C. To receive my monthly Wartime Wednesdays blog post and my updated activities, sign up by entering your email address in the yellow box on the top right-hand side of this page. 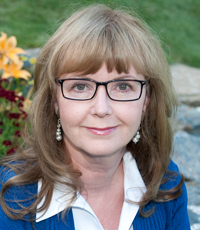 You can also follow me on Facebook at Elinor Florence-Author, on Pinterest, Goodreads, Twitter, and more recently, Instagram. Have a very happy belated spring!